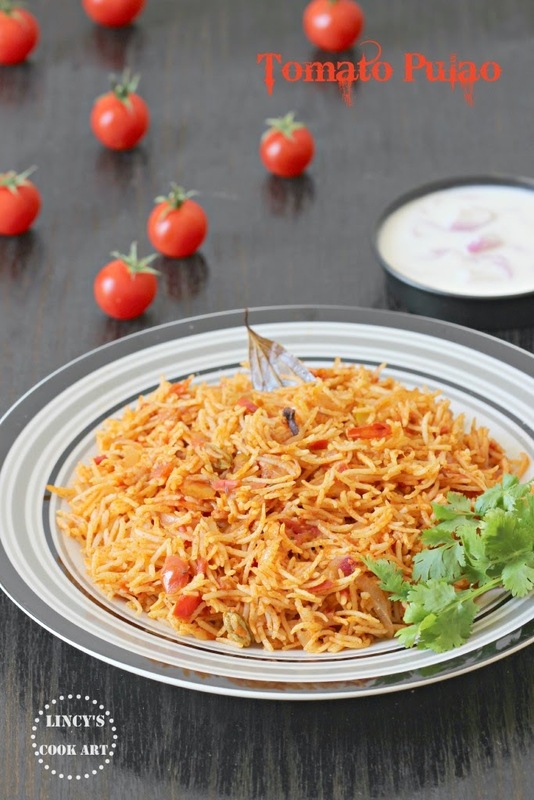 Tomato Pulao is a simple and easy to prepare, colourful pulao which could be made in a jiffy with the ingredients available in your pantry. I have earlier shared the Tomato Rice/ Thakkali Sadam which is a Tamil Nadu special variety rice often prepared at every home. 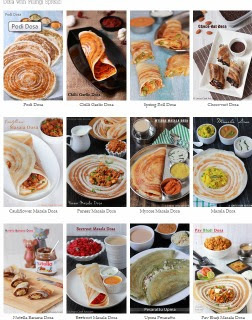 This is another variation which i had tried at home after marriage. We love the garam masala flavour in rice than the mustard seasoning. So i tried the tomato rice with garam masala flavouring and eversince it has become a dish that is now often prepared at my home. 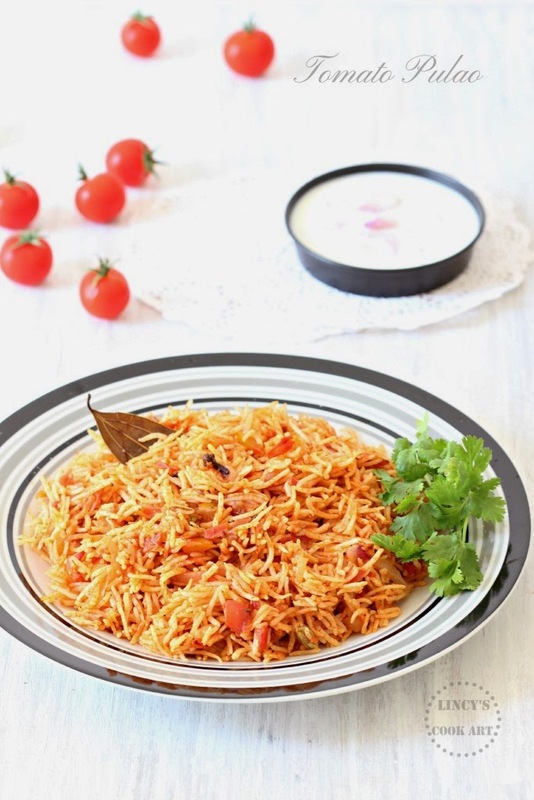 This pulao could be prepared with the leftover rice too. The ultimate recipe to make for kids lunch box too. Cinnamon bark- 2, cloves-3, cardamom-4, bay leaf-1. There is also the third method to follow which is to half cook the rice with salt and drain the excess water; allow to cool by spreading in a flat plate. Heat oil in a pan; add the raw garam masala spices cinnamon, cloves, cardamom and bay leaf. Add the chopped onion and cook with a pinch of salt till it starts to become golden at the edges. Now add the slit green chillies and ginger garlic paste; saute in that oil till the raw smell leaves. Add the chopped tomato and cook till soft; add some salt and cook till mushy. Add the chilli powder and garam msala powder; cook for thirty seconds till the raw flavour of the masala leaves. Add the half cooked rice and mix well. Add salt if required. Sprinkle the coriander leaves and switch off the gas.